Open to private events, weddings, and special parties. 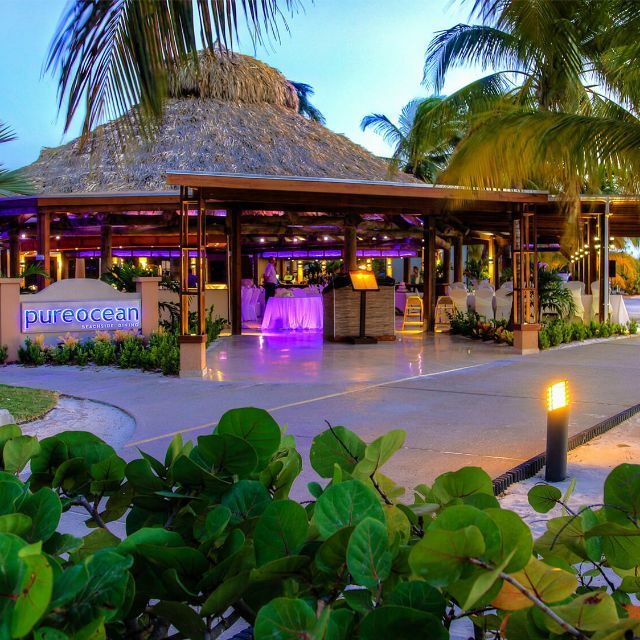 Pureocean is situated under palm trees wrapped with twinkling lights. 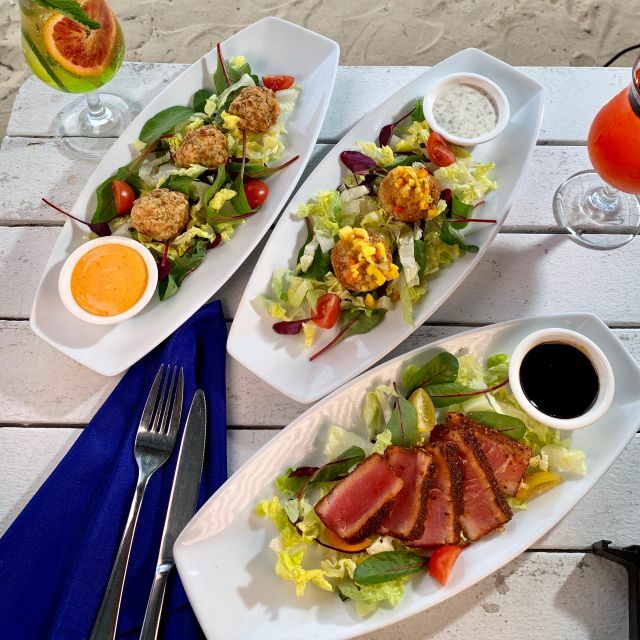 It's the perfect setting for a romantic dinner, and no matter where you choose to sit, you’ll have a perfect view of Aruba's spectacular sunsets. 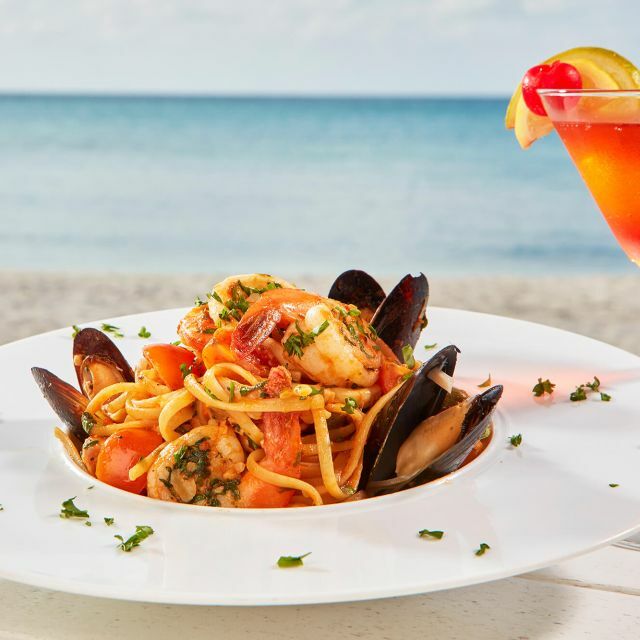 Pureocean’s dinner menu, served 6-10 p.m. daily, features fresh, local seafood, international options and island specialties. Saturday night we serve our popular Caribbean BBQ Buffet. Daily Happy Hour. Pureocean is open for a delicious breakfast buffet 7-11 a.m. daily, featuring hot and cold dishes, omelet station, fresh fruit, pastries and more. What an awesome family dinner at Pureocean. Our waiter Sean, made the occasion our very best on the island. From the song requests, to picture taking, to the food recommendations, the evening could not have been better. The Tomahawk Pork Chop was incredible! And oh yea, what a view! The venue is beautiful, the food is fresh and delicious and the service was perfect. 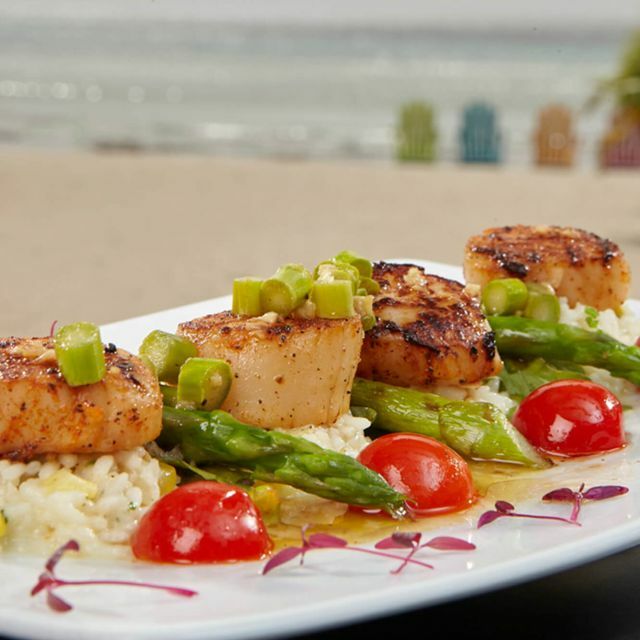 We had the scallops and the coconut crusted grouper. Fresh, presented nicely and the taste exceeded our expectations. The only thing I would have changed are the tables and chairs as they are not very comfortable. Loved sitting on the beach to eat though! This was my favorite restaurant in Aruba. We had reservations for 6:30 With a table that gave us a breathtaking view of the sunset. I ordered seafood mac and cheese, the best I ever had. Our waitress was so attentive. We will definitely be coming back. This was a very poor experience from the waitress and the “meal.” The margaritas were horrible, and the first warning sign was being asked what liquor we wanted for the margarita. After ordering our entrees, 30 minutes later, we still did not have our food. The couple at the next table ordered soup (lobster bisque), which was sent back because it was cold. I would not recommend this restaurant for anything outside of the view. The wait staff were not attentive or warm. Shawn was very hospitable! Very good food. Unbelievable views and ambiance! Our waiter Luis was great! beautiful setting, staff was wonderful about taking beautiful sunset pictures. This was a really nice restaurant. 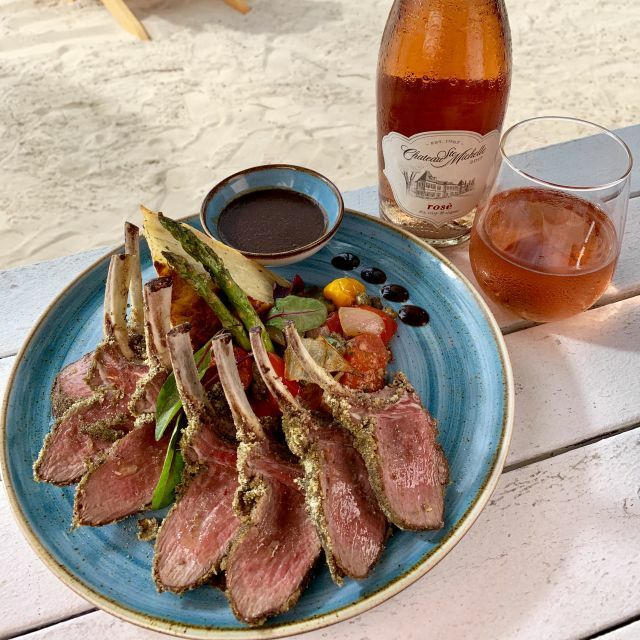 There are a few restaurants in Aruba that have nice ambiance for evening dining on the beach but the menu at Pure Ocean seemed better so we chose this one to catch the sunset while dining. The staff was awesome. Even took some great birthday pictures in the sunset that my friends still rave about. Our waitress without me asking, offered to take even more photos for us. The food was great as well. Did not disappoint. 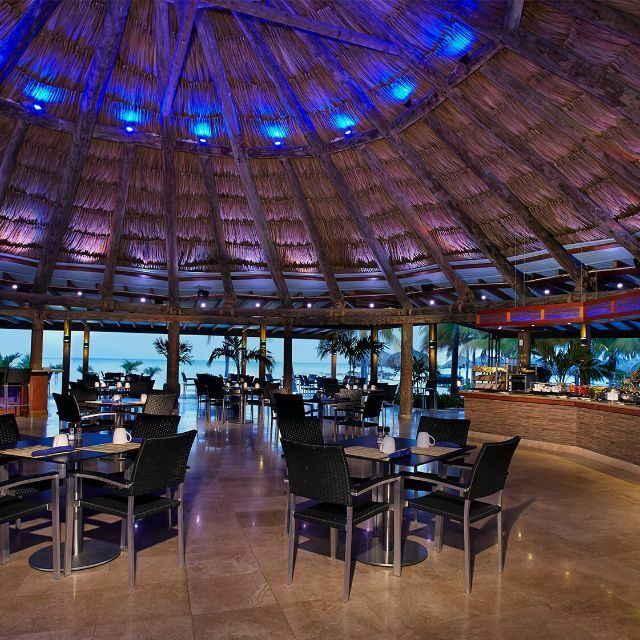 Really nice and quiet location right on the beach and perfect for dinner. Our family had a fantastic meal to celebrate a birthday! The food and presentation could not have been better. The service was very friendly and attentive. The setting was amazing-a gorgeous, quiet spot with nice lighting on the beach under the stars. Will return, for sure! Thank you, Pure Ocean and Shawn for a wonderful evening. Wonderful setting and food and service - can't ask for anything better. Very romantic. Food was delicious. We highly recommend. Best sunset view too! Great ambiance with live music and great food. Service was excellent. Right on the beach. After dinner we just walked along the shore. Would definitely recommend and go again. The location is awesome. The food is average. I would have given 1 Star more if they at least would offer a good choice of wine for an acceptable price. Very much enjoyed the food and ambience! The food quality, service and presentation was excellent. The atmosphere was perfect as we sat outside on the beach. Service was very, very slow. We ordered a bottle of wine before our appetizers showed up to have with dinner and got it after our dinner showed up. Food was decent, but not worth the $. Also, they would not give us an itemized bill for the night. The server told us we had to walk up to the hostess area to view the charges...very odd. Overall, 4/10. 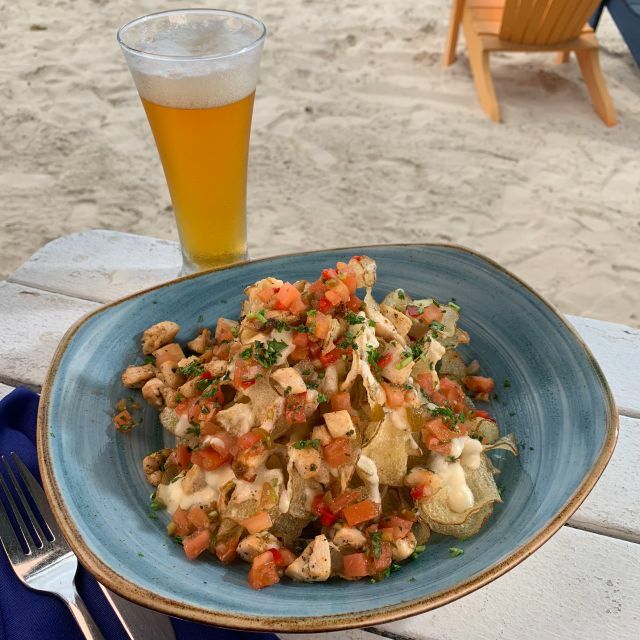 Food was ok, setting on the beach was really nice. But unfortunately the service was by far the worst. Location and ambience was wonderful. Our food was very good. The only issue was my filet came well done and I asked for it medium. By the time it came back my husband and I were not on the same eating level. It caused his wine not to come until he was done with his entree. All said, I would gladly go back again. Quality was excellent and service was very good. Things like that happen, and they were quick to solve. We loved all of the food! It was incredible. Definitely come here with the mindset of island vibes and a relaxed pace. The ambiance is perfect, but dinner did take quite a while to come out. It was great for us, because we wanted to enjoy a romantic dinner!! Everything was bad besides being on the beach. Service was terrible and food was also just not good. The pistachio crusted sea bass was the best I've had in Aruba as well as the chicken saltimbacca. The ambience and saxophone player was amazing. Just an overall beautiful night!! Great atmosphere & so accommodating to our group. Wonderful dining experience. Could not have asked for a better experience. Our waiter (and the entire staff) was so entertaining, helpful and attentive. The food was perfection. I had the sea bass and my husband had the Caribbean mac n cheese. So good! Cooked to perfection and the sunset doesn't disappoint. I'd give 10 stars if I could. Great food. Service was a little slow but the waiter did keep us updated the whole time. Great place to just sit back and relax and not rush. Nice dinner date while Ronaldo played a trumpet in the background. Nothing too loud and played about anything we could throw at him. I recommend keeping him a regular. We loved having our feet In the sand and watching the sunset as we had our dinner. I was with my husband and 3 children. The food and service was great and the ambiance was amazing. We loved it! The setting is amazing but unfortunately the food is not that good -we ordered lobster bisque, steak frites, scallops- very average. 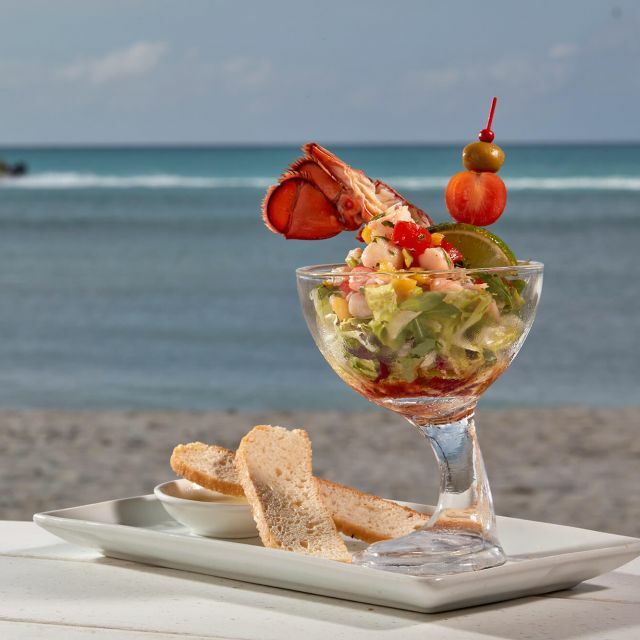 It’s worth going for the outdoor dining on the beach. I enjoyed the outdoor sunset dinning. The have a tent set up which helps keep the wind under control which is smart. 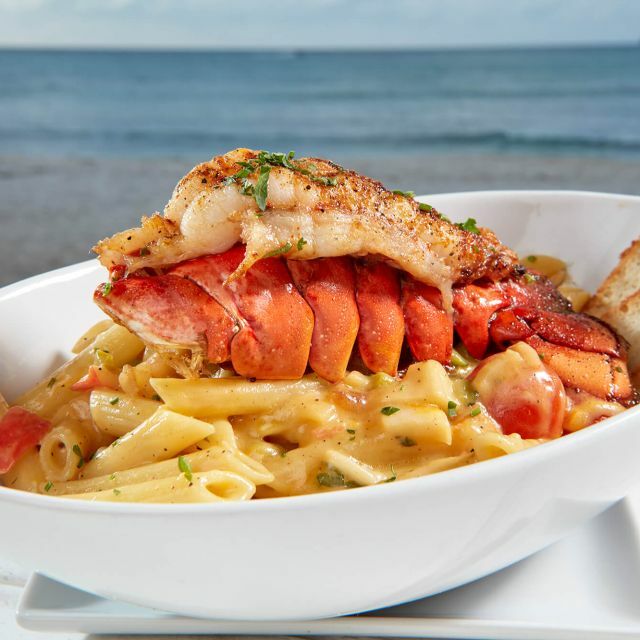 I had their lobster mac n cheese dish which was very good and lived up to the reviews I read about this dish. The service can be slow at times but it's ok if you have a drink and are enjoying the sunset outdoor dinning. Probably better to order a bottle a wine, an appetizer to share and just take your time enjoying the view and later order the entry. Please note a 15% tip is already included in the bill. The ambiance is high anyway from the beautiful views, and the musician playing several wind instruments added to it. We had the wine pairing for two special. The surf and turf was scrumptious. It was a fine bottle of Merlot. Lidia was a fantastic server. Food was great, ambience was priceless. 3 scallop dinners were lukewarm, sea bass was perfect. Charging a 15% service charge & expecting an addition 20% gratuity is outrageous, unfortunately I can not return. Its A shame.